Amazon.com description: Product Description: In this Wall Street Journal bestseller, Jessica Herrin, serial entrepreneur and founder and CEO of the Stella & Dot Family Brands, shows how the classic traits of successful entrepreneurs are ones each one of us can develop--and use not only to create a company, but also to create an extraordinary life. Whether we work a corporate job, run a family, or run our own business, Herrin offers realistic, attainable steps each one of us can take to achieve extraordinary success on our own terms. Through candid and inspiring lessons from her life as a successful CEO and working mother of two, as well as stories of many amazing individuals sheâs met along the way, Herrin inspires and empowers us to dial up the sound of our own voices and make our authentic dreams a reality. This book isnât about having it all; itâs about having what matters most to you. It is about how to find your extraordinary--your extraordinary career, your extraordinary happiness, your extraordinary life. 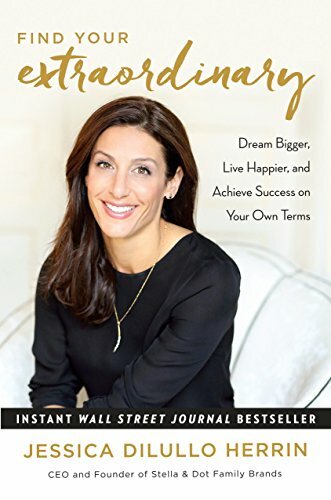 About: In this Wall Street Journal bestseller, Jessica Herrin, serial entrepreneur and founder and CEO of the Stella & Dot Family Brands, shows how the classic traits of successful entrepreneurs are ones each one of us can develop--and use not only to create a company, but also to create an extraordinary life.